William Blake (1757-1827) was neglected and misunderstood during his lifetime, but has been admired in modern times as a visionary and an inspiration for generations of artists and writers. 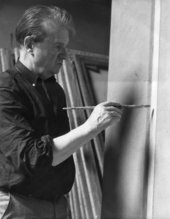 This display will focus on how his mystical and Christian legacy was combined with surrealist and modernist themes in British art from the 1920s. Meet the artist who saw angels (and ghosts! )...and painted pictures of them!